As the mother of a toddler, I'm constantly impressed at how quickly the day can become overwhelming. Even before having a child, there were days where I felt like if I wasn't careful, the whole world would spin out of control. Between juggling work, exercise, and keeping a house somewhat clean, the day can feel like a series of falling dominoes. 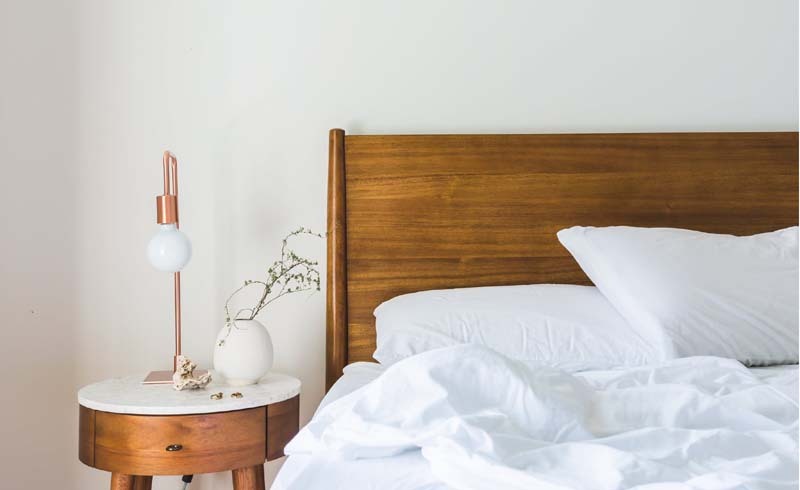 While some people like to prep for their day with yoga or by listening to some uplifting music, the one thing that is transformative to my day is making the bed. Much like making the perfect pot of tea or pouring a cup of coffee, there is a ritualistic aspect to making the bed. It signals to my exhausted body that sleep is over, even if I wish I could crawl back into bed. As I bring the blanket to the headboard and stretch it across the mattress, I am committing myself to a productive day, one removed from slumber and ready for new experiences. Even though I'm sure this is partly eye-roll inducing, since it's probably something your mother tells you to do, sometimes mama is definitely right. While it's easy to scoff at a task so simple, making the bed can seriously change your whole mood. After a bad day where nothing went right and I'm exhausted, at the very least I managed to do that easy task of making my room look and feel more put together. At least I managed to accomplish this task, and sometimes that's enough to make the day feel more successful. There is nothing worse than coming home to an unkempt house. It just feels icky, and I'm not even a clean freak. However, the simple act of making my bed helps me be more productive. I've noticed that the mornings when I make the bed I am more likely to actually hang my towel up instead of draping it over the door knob or leaving it on the floor. My dishes magically find their way to the dishwasher instead of the sink. In short, my whole apartment benefits just by focusing on one manageable task. The best part about this simple act is that you get to choose how much effort you put into it. Some days, OK most days, I'm still feeling lazy and I'll just pull the blankets and sheets up, smoothing out the top. Other days when I'm feeling super fancy, I'll tuck the blanket and sheets back for a more polished look. Pillows, throw blankets, and decorative folds are all personal elements that help create a put-together bed. Regardless of your style, making the bed takes only a couple minutes and can transform your whole day. Life can be pretty challenging at times. But I know that if I've done nothing else in my day, at least I managed to accomplish this task, and sometimes that's enough to make the day feel more successful.